Chances are, you have some of this material on The Exciting Gene Krupa, Sing Sing Sing and The Driving Gene Krupa, but not like this. 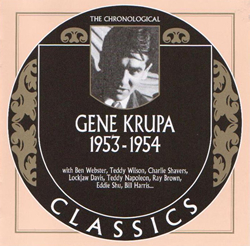 This CD issues, in chronological order, all Krupa sessions from September 10, 1953 until February 2, 1954. And, it sounds like everything has been remastered, to boot. You've never heard Eddie Shu and the boys sound like this. Tracks: Midget, I'm Coming Virginia, Payin' Them Dues Blues, Jungle Drums, Showcase, Swedish Schnapps, How High the Moon, Love for Sale, Booted, This Can't be Love, September Song, Harmonica Shu Boogie, Don't Be That Way, Sing Sing Sing.